They were playing Cowboys and Indians for real back in the old west outpost of Adobe Walls Texas, and the Indians were winning. (Some how I like the sound of that). But the group of trappers and mountain men were holding there own, but pinned down the by Indian Calvary attack. After a few surges in the battle, the Indians backed off out of what they thought was rifle range, and began taunting the Texans. Billy Dixon had about enough of this and steadied an 1874 Sharps rifle in 45-70 at the distant tormentor. The Indians didn’t hear the shot, nor see the distant puff of smoke from the lone rifle man hunkered down by the wall. But suddenly there was a womp sound and the band of warriors was suddenly without a war chief. That was the longest recorded black powder cartridge shot of all time. The distance was one mile. Since about 1873 technology allowed for the practical contained metallic cartridge to be fired from many gun designs but the use of smokeless gun powder did not arrive until 1894 when the first smokeless design was introduced as the 30-30 Winchester cartridge. This era of black powder cartridges was the time when the West was won. 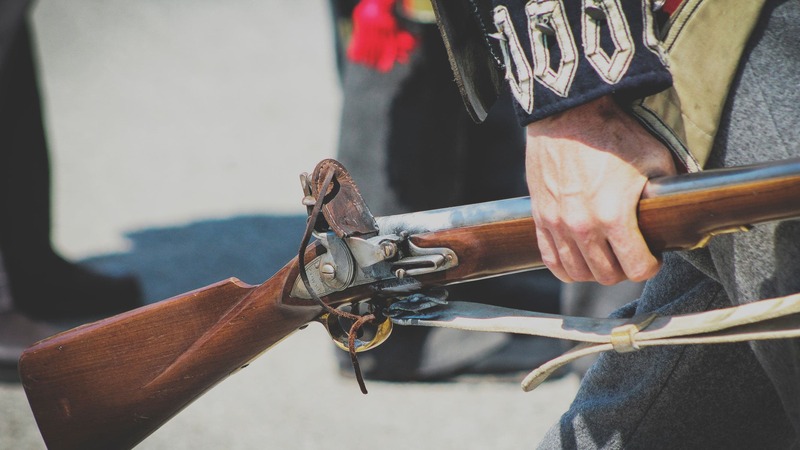 Of the popular black powder guns there are two types of long guns. The Henry, Marlin and Winchester lever action repeating rifles in cartridges like the 44-40, and the powerful single shot rifles that ranged in calibers from 38-55 all the way up to 50-140, which were known as the Buffalo Guns. They were the Remington Rolling Block, Sharps 1874, Browning (Winchester 1885) high and low wall, and the 1873 Trapdoor Springfield rifle, to list the most popular. Great news for the modern hunter with the recent passing of SB-165 in Louisiana, we can now not only use the crossbow during archery season, but also the Black Powder Cartridge rifles of single shot design during muzzle loading deer season. This should open a new door for the Old Time rifle enthusiast that wants to hunt with such a piece of American History. Of course there are the usual misconceptions. The first being these guns will outshoot the present inline muzzle loaders. Well they can if you happen to be a world class shooter. But it is doubtful if the first guy that picks up a Sharps and sees “Quigley Down Under,” can hit a white-tailed buck at 900 yards. Most likely the Black Powder rifles will be employed at ranges under 100 yards just as most any other deer rifle. Regardless of muzzle loader or breech loader, few deer will hang around long enough to give you a second shot, so once again practice is the key to success. The most popular will most likely be the 45-70 Government cartridge. First seen in the Trap Door Springfield single shot rifle it was the gun that almost lost the West. At the Battle of the Little Big Horn all LT Col George Armstrong Custer’s men, all 211 of them, were armed with a trapdoor. Now take about 2000 Sioux Indians who had Winchester and Henry repeaters, and the fact that Trapdoor guns start jamming after about the 5th shot and you can see why the 7th Calvary didn’t come out so well. Never the less the 45-70 is an excellent hunting cartridge on big game. It comes in 3 versions due to the fact there are still Trapdoor Springfields around which will not take modern loadings. First is the black powder cartridge and then a light smokeless powder version that sends a 405 grain bullet out at about 1350 feet per second. Trust me when I tell you, this is more than enough for deer hunting. There are also smokeless magnum loads, which will propel the bullet up to 2300 feet per second in a replica Browning High Wall 1885 rifle. That gun and others like it are awesome firearms that can take African Dangerous Game. 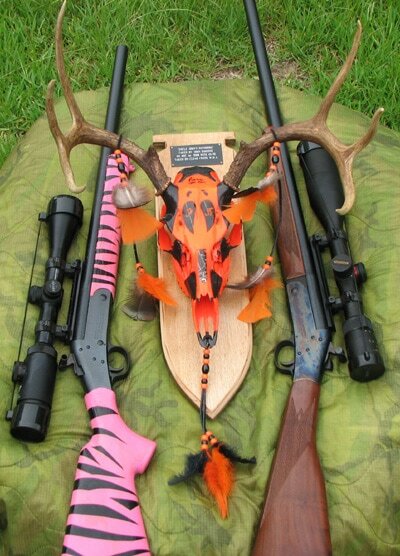 The Marlin 1895 in any of its forms is an awesome medium range big game rifle. Used during modern rifle seasons, a 400 grain Buffalo Bore bullet is more than adequate to take on any North American game. This is a preferred rifle of Alaskan guides hunting big bears. As a deer or hog rifle they just don’t make one more effective. it collapsed and rolled away sideways. I noted that I felt the impact of the shot come back on me like an echo. This is the only cartridge I’ve seen that will honestly beat the 350 Remington Magnum and the 325 WSM as a DRT rifle (Dead right there), but don’t worry the only difference is, you don’t get the cool side ways slide. Looking for a good name for my H&R “Old Slider” seems perfect don’t you think? Now if you don’t want to get the kick that the 45-70 dishes out, the same rifle comes in a 44 Magnum. Legal in both Mississippi and Louisiana as a primitive caliber the 44 magnum will put the biggest buck in the world on the wall with one shot. I killed 8 Moose with one in a hand gun and some pretty big wild bore as well, so guns like Aunt Sandy’s “Pink Tiger” will put them down without all the kick. Don’t think for a minute that the little short 44 magnum won’t put down a Buffalo either. As the new season comes into play it looks like single shot rifles of 38 calibers and above with exposed hammers originally designed before 1900 will be allowed, and you can use Black or Smokeless powder cartridges. The gun may be equipped with a magnifying scope. This includes replicas and recreations of such weapons that arguably cover most Hinge Action types like H&Rs 1881 rifles, but not the Thompson Encore rifles 1964. With this it is doubtful many hunters will actually use real Black Powder rounds opting for the cleaner Smokeless powder ammo. After the first year of primitive weapon hunting in Louisiana, many stayed with their muzzle loaders. The most popular of the single shot cartridge rifles was the H&R 45-70 due to the reasons of affordability and reliability. Personally I’ve been hooked on the H&R’s for years in all rifles and shotguns. Never the less anytime you shoot a black powder gun, with Black Powder, you have to clean it immediately or there can be some bad damage. The new modern primitive hunters see this immediately and will use smokeless powder ammo almost every time. So if you like the idea of the black powder cartridge rifle, it is now here. When you get one, and you just have to use black powder ammo, remember to clean it after a shooting session, or you might find out how Custer felt. Pass it on.